Northwood Commons Backyard Bird Blog! | A Feature of Wild Birds Unlimited in Clearwater/Safety Harbor, Florida! Providing quality wild bird seed, feeders, houses and decorative items for your backyard habitat! WBU Critter Videos With Florida Favorites! Northwood Commons Observation Area Photos! Wild Birds Unlimited Clearwater/Safety Harbor’s Partners! Northwood Commons Backyard Bird Blog! A Feature of Wild Birds Unlimited in Clearwater/Safety Harbor, Florida! Providing quality wild bird seed, feeders, houses and decorative items for your backyard habitat! Ghosts and Ghouls and Florida’s Creepy Crawlies! It’s October in Florida! Time For… Weird, Wild Bird (and other) Profiles! Scooter Aint Skeere’d! Thanksgiving has Turkeys. Christmas has Cardinals and Doves. But Halloween tops them all with a load of fun and interesting –some would say, “creepy”– flying denizens of the sky just waiting to swoop down and wreak havoc on…. seed stores and bugs! What? Did you think we’d suggest something more sinister? Naaahhh... most fears related to Florida’s less-than-cuddly flying things are completely unwarranted. This week, we open the month of October with a Halloween theme beginning with one of the most misunderstood creatures to grace Florida’s evening skies… the ever-elusive… BAT! According to WBU Clearwater/Safety Harbor partner, the Florida Bat Conservancy, Florida welcomes 13 different species of bat. Of this 13, seven are what they call, “accidental species” who may not live here but do visit. However, all of Florida’s bats are insectivores, meaning they dine on bugs and not…as many believe…on the pale necks of fair maidens draped in muslin gowns. No! While Vampire Bats do enjoy a tasty meal of blood (Gulp! )… they remain primary citizens of Central and South America where they feed on cattle and common livestock and not, Scooter repeats… NOT… on the necks of village innocents. Florida’s Bats serve an invaluable service to Florida’s communities. Each bat can consume up to 3,000 insects in one night alone. And considering Florida’s annoying over-population of mosquitoes… that’s a benefit that cannot be denied! While most of Florida’s nighttime aerial dancers live in small groups called colonies, some may actually prefer a more solitary arrangement; living in the hollows of trees, behind palm fronds or in small cavities of buildings. Since some colonies can pose an issue for homeowners and local businesses, Wild Birds Unlimited in Clearwater/Safety Harbor suggests covering small holes or other entry points where bats may seek shelter or a roosting opportunity. If you’d like to safely welcome bats into your community, WBU Clearwater/Safety Harbor also suggests placing its Bat Boxes away from buildings or other structures where bats may be enticed to roost in a colony. Placing Bat Houses in an area of your community will help keep bug populations in check! AHHH! They’re flying after me! No. They’re not. Although seeing someone dodging a bat’s dive into their personal space is amusing… the assumption that they’re deliberately aiming for someone’s hair or jugular is a myth. Bats use echolocation to spot insects as they fly in the evening skies. Because insects are attracted to light, you may see bats diving close to homes where floodlights are used near porches, deck areas and streets. Bats are Blind! No, again. Bats actually have very acute vision. They use echolocation as an added sense to track fast moving insects in flight. Bats are related to birds! Bats are actually related to… US! Primates. Bats have no feathers and birth their young live as opposed to a bird who hatches its young from a fertilized egg. Bats have held an often tragic mythology which can lead to a rash of actions damaging to their numbers. Aside from these intrusive actions, often meant to rid large colonies from perfectly harmless roosts, disease can play a large role in their dwindling numbers. White-Nosed Syndrome, first diagnosed in early 2008, stands to wipe out an enormous range of Bat colonies. Roosts in 25 states and five provinces in Canada have succumbed to this disease, wiping out thousands of bats since its detection. According to the National Wildlife Health Center, WNS has caused a sharp and frightening decline in the bat population of nearly 80% in the Northeast United States alone. This decline not only effects the bat population itself, but farmers who depend upon this crucial animal to deter and prevent growing insect populations who thrive on crops of corn, wheat and other food-bearing plants. Bats are nature’s purest form of insect control, but their numbers are shockingly low. Propagate bat colonies in your community by setting up bat houses and communal areas where bats may seek to populate and roost. Leave old growth alone. Loss of habitat is another factor injurious to Florida’s bat population. Large trees with gaping holes are perfect for bats to colonize. Unless the tree could do harm to people or property below, it should be left in its place to provide a safe and natural roosting area for a bat colony. Spread the true word about bats. Aside from ridding our Florida backyards of pesky mosquitoes, bats contribute to the health of America’s agricultural crops to the tune of 4 – 50 billion dollars a year. Want your food prices to go down? Save a BAT! Over the centuries these often maligned creatures have sent shivers up the spines of many a theatergoer. From “Dracula” to “Cujo”, bats have been culled into a herd of monsters with no reputation for their inclusion. On the contrary, they provide an invaluable service to humankind keeping sometimes deadly insect infestations to a minimal brink and spreading new growth as they naturally deposit the seeds from the fruit they also enjoy. With all due respect to Mr. Stoker and Mr. King… as far as these small creatures are concerned, those guys are blind as bats! Keepin’ it cool for Florida’s wild birds! It’s summertime all over Pinellas County and, like everywhere in Florida, the heat is rising in Wild Birds Unlimited’s Nature Shop and its Northwood Commons Backlot preserve area. The birds are fluttering and Scooter is sweltering! But, do we have to do anything to cool the sweaty feathers? I mean, aren’t birds sort of self-sufficient when it comes to regulating body temps? Well, in a way, yes. However, they still get hot and can actually overheat and become distressed. So it’s best for us, and our wild bird pals, if we ensure they have some comfortable respite from the sun and heat. How do birds cool off? Well, obviously, they’re not parading around in Kardashian attire along Florida’s shorelines to stay cool. Most backyard wild bird visitors cool themselves by ruffling their feathers and/or stretching wing to allow hot air to escape while cooler air swipes relief along their mid-sections. This is the most common way across a variety of species, that wild birds seek to cool themselves in a raging heat. Meanwhile, our native wild birds, cardinals, Blue Jays and mourning doves strive for a meager bit of shade. And, while they don’t sweat, they do pant. Like dogs. This can actually wear them out rather quickly making it harder for them to lift into flight in order to evade predators. But, there are simple ways in which we can help Florida’s wild bird visitors to keep cool and comfy during Florida’s dog days of summer. Check out the videos below provided by Wild Birds Unlimited and discover ways you can help! We often hear about the hyper, almost maniacal, protective natures that wild bird mothers -of any species- show towards the safety and welfare of their offspring. I’m not saying Florida’s wild bird Moms are crazy taking care of their kids, just that Dads can sometimes be a hoot, too. And maybe, just maybe, they deserve some credit for some of that wacky parental behavior we usually assign solely to Moms. Let’s read about some of the ways Florida’s wild birds fathers can surprise us with their nurturing efforts and sincere defense of their wild bird babies. We hear stories of wild bird mothers moving babies, lodging nests and guarding fledglings as they learn to fly. We see them perched in vigorous defense against cats, dogs, predatory birds, and the common and average landscaper or Girl Scout on unexpected approach towards a nesting area. We have all been there. But, as Father’s Day approaches along our Florida shores, Scooter, in his infinite wisdom, wonders on the recognition -or lack-thereof- of Man. The male of the species… each of us has one… a Father. Even Scooter has one! However, although stories surface from time to time, we don’t often hear too much on the important roles father birds play in the crucial aspects of raising healthy, strong and vibrant young birds. And why does this matter, you ask? Scooter did, too…so we went to look into the details of how some birds raise their young and to highlight, for Father’s Day, just how critical the male of the species can be in order to ensure the longevity of Florida’s Wild Bird population. Parenting... it aint just woman’s work! Cardinals: The Male Cardinal, highly aggressive during its breeding season, will risk life and limb to defend its territory from interlopers. Crashing into windows, cars, doors and any number of reflective surfaces, the male cardinal is a passionate defender and loyal -to the extent of its socially monogamous nature- to its mate. While the female cardinal roosts upon her nesting eggs… the male will forage for food. As he approaches, this Florida wild bird favorite will feed its mate as she rests. As the babies are born and grow, both parents feed the young and the males apply a heavy and consistent emphasis on the direct support of their offspring. Downy Woodpecker: The Male Downy Woodpecker is described as one of the most watchful and involved wild bird fathers. Seen throughout Florida, this wild bird father will do the majority of the incubating while the female watches from a nearby location outside the nest. Along with his attentive nature as the eggs incubate, Downy Woodpecker fathers will often remain close to their young even after they have left the nest. Often times, these wild bird fathers will still lead offspring to food sources, and feed them directly for some weeks even after their babies have fully left the nest. 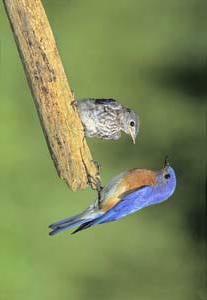 Western Bluebirds: Male Western Bluebirds have a very intense role as a father. As a son, they serve as a help-mate or nanny to their younger siblings. While many a brooded clutch will leave the nest and disperse for pastures of their own, some male bluebird sons will remain with their parents. While staying near to their parents, male adolescent bluebirds will assist in feeding and raising the young of subsequent broods until the following season hen they too leave to begin a brood of their own. Northern Mockingbird: Knowing that a strong foundation is the key to a successful family, the male Northern Mockingbird builds its nest atop a strong foundation. Designed with a stable undercarriage of thick vines, twigs and sticks, it is the father Mockingbird’s role to create the foundation of the nest. His mate follows his construction with her own touches on the interior, using soft linings of moss, leaves, and grasses shaped into a cup. While male Mockingbirds incubate far less than other birds (with the exception of the Hummingbird which does absolutely nothing after he mates with a female counterpart. Scooter is HORRIFIED! ), they do vigorously defend and protect their nest, their mates and their offspring. Often seen perched above their fledgling young, male northern mockingbirds teach their young to fly while fending off any perceived danger in an area that could reach a circumference of several hundred feet. So while mother wild birds are often rightfully touted as being the glue that holds the nest together, let’s not forget that male wild birds also play a very crucial, yet highly underrated and underreported role in the lives of their Florida’s baby wild birds. With gregarious displays of protective fervor, Florida’s male wild birds prove that no matter the size, no matter the beauty, no matter the assumed fragility… a father of any feather, is a diligent protector, provider and loving partner. Check out these great gifts for dad and have a happy Father’s Day from Wild Birds Unlimited in Clearwater/Safety Harbor, Florida! Cool eye gear and some great reading material for your dad on Father’s Day! It’s May, Florida! Time to Celebrate Mother’s Day with Wild Birds Unlimited! Mother’s Day is fast approaching in Wild Birds Unlimited’s Northwood Common’s backlot and Scooter and his Florida wild bird pals have some great ideas on how you can help –and celebrate- Florida’s wild bird Moms while remembering your own this year! Florida’s wild bird moms could use a helping hand as they build and feather their nests. Try handing them some of WBU’s Woolies Nesting Materials to help them out. Placed under trees, shrubs and other areas where birds frequent, woolies will help Florida’s wild bird Moms to keep a clean, healthy and comfortable nest for their growing wild bird babies. Find the perfect spot in Mom’s yard and surprise her with a brand new nesting box! Many mother birds love a great nesting box in which to raise their young. Nesting boxes can be placed nearly anywhere and make an excellent gift for Moms who need to take a break and relax with some nature! Scooter says don’t forget the furry Moms out there! Yes, squirrels and their ilk tend to be a bothersome factor for many wild bird watchers. But, they are a valuable and important part of Florida’s ecosystem so let’s give squirrel Moms a break too with some nuts, seed and a great spot to sit with a WBU squirrel feeder! Help your backyard habitat wild bird moms with dinner, too! Brooding hens need all the nutrition they can get. Offer them fortified seed and suet to help keep them strong as they raise their babies. No matter the spot, no matter the gift, no matter the day… let’s honor mothers from all walks of life -and all sides of nature- for the love they give, the nurturing they offer and for encouraging us to fly when our own wings were so small and unsure! Happy Mother’s Day from Wild Birds Unlimited in Clearwater/Safety Harbor, Florida! Spring is Just Around the Corner, Florida! Get those Bird Feeders Ready! It’s March and that Means Spring is on the Way! Feed Your Wild Birds Well! Mealworms are a high-protein favorite of many of Florida’s wild birds such as bluebirds, wrens, robins, chickadees and mockingbirds. Because mealworms can potentially crawl out of feeders, it’s important to offer them in feeders with smooth sides like our Advanced Pole System® SideDish™ and Dinner Bell. Try offering seed cylinders if you’re looking to add more flavor to your Florida backyard habitat. We carry an assortment of seed cylinders, including Deluxe, Supreme and Cranberry Fare. They make feeding your birds easy. Just set one out and watch! Our Seed Cylinder Feeders are the perfect blend of creative design and wild bird feeding functionality, and are capable of housing several sizes and types of seed cylinders. Suet is a high-energy, pure fat substance that entices a multitude of birds, including insect-eaters. Our Suet Snacks are small nuggets of suet that birds love. 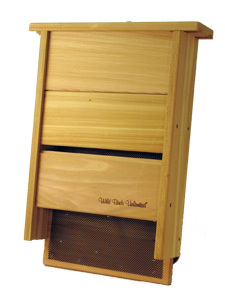 We also carry a variety of feeders that hold suet or Suet Snacks. Stop by this month and let us know what kind of birds you want at your feeders. No one has a better selection of bird food than Wild Birds Unlimited. And whether you’re looking for a champ or a challenger, we’ll make sure you have the food and feeders you need to make your backyard reign supreme. Our Choice Blend bird seed is a fantastic combination of high-oil content seeds. The black oil sunflower, sunflower chips, striped sunflower, safflower and peanuts do a great job of attracting a variety of birds including chickadees, woodpeckers, titmice, nuthatches and jays. Try this remarkable seed blend in a hopper feeder, tube feeder or our Dinner Bell feeder, and add loads of fun to your backyard bird watching experience. Each of our seed blends is regionally formulated to attract the birds that live in our area. We do not include filler grains like oats, wheat and milo that decrease the price per pound of a mix because these filler seeds are less attractive (or not attractive) to birds. Because there is no wasted seed, our blends actually end up costing less to use while attracting more of the wild birds that you want to watch. Your Florida backyard is your safe haven. It’s your place to relax, a place to get away from it all. With Wild Birds Unlimited exclusive, patented Advanced Pole System® (APS), you can create the ultimate station that will attract the best of Florida’s wild birds to your backyard. Be sure to place your feeding station in a location that helps prevent window strikes and/or keeps squirrels off your feeders. Window Strike Zone: To see birds up close, place your setup no more than three feet away from your window. This will decrease the likelihood of birds injuring themselves if they do hit your window. Otherwise, place your setup no less than ten feet away. Squirrel-proof Zone: Place your baffled station at least ten feet away from other objects that squirrels can jump from to make it unreachable. Start your custom APS bird feeding station by twisting the 4-foot Base Pole (denoted as (a) in the picture) into the ground. Then slide the Stabilizer (b) onto the Base Pole and secure it into the ground to keep your station looking great and standing straight. Next, place an APS Extension Pole (c) on the Base Pole. Then simply add a Double Crook Arm (d), an EZ-Attach™ Crook Arm (e) and an EZ-Attach Decorative Branch Perch (f). Our EZ-Attach design makes adding accessories to an APS setup a snap. Just slip the EZ-Attach unit on an extension pole and pull down to secure. Top your feeding station with one of our many finials (g). If you have squirrels or raccoons that would become a nuisance at your new feeding station, be sure to add a squirrel or raccoon baffle (h). Finally, fill and add your feeders. February is Wild Bird Feeding Month, Florida! It’s February! Time for hearts and flowers and boxes of candy, and… feeding Florida’s wild bird population. Cornell University’s Lab of Ornithology, along with the National Audubon Society, have partnered with Wild Birds Unlimited to create the, “Great Backyard Bird Count”. This joint effort will involve local wild bird watching enthusiasts in helping to collect data on the migration and habits of wild birds all over the United States. There are many ways you can get involved and help ensure Florida’s wild bird population remains a healthy and vibrant part of our natural environment. First, sign up for the GBBC by going to Cornell’s website, here. Then, head to your local Wild Birds Unlimited Nature Shop in Clearwater/Safety Harbor and stock up on seed, feed and supplies to make sure your Florida backyard habitat is the best it can be. We carry a wide variety of optics and other tools for the beginning bird watcher or the seasoned wild bird enthusiast. With great brands like Denali, Shrike and Vortex, you’re sure to be able to spot the best and the brightest of Florida’s wild birds! Come to the shop today and ask Carl about all the terrific options for your best wild bird watching experience. Check out our WBU Video which explains the great ways you can be involved and enjoy helping in this year’s Great Backyard Bird Count! Wild Birds Unlimited Clearwater/Safety Harbor’s Christmas Gift Product Profile: Seed Characters! Merry Christmas from the Northwood Commons Back Lot! Well folks, it’s that time of year again. Scooter, with Vinny in tow this time, is out in the Northwood Commons Back lot tidying up the nest in preparation for the holiday arrival of all his northern cousins! He’s all excited and ready to share his ideas for the best gifts to give to your family and friends this Christmas season! Each week in December, we’ll show off a terrific gift idea that you can buy right here from your local Wild Birds Unlimited Clearwater/Safety Harbor Nature Shop! From seed, to feeders to bird baths; from reading material and even high powered optics, Wild Birds Unlimited’s high quality products make gift giving fun, easy and perfect for those especially hard to please family and friends. Look below for this week’s Wild Birds Unlimited Product Profile! As one of our most popular products, Wild Birds Unlimited’s line of fun and useful Seed Characters make for a terrific gift for anyone! Their fun, animal designs make them especially great for children! Use our seed characters to introduce them to the wonderful world and educational hobby of wild bird watching in your own Florida back yard habitat! Made from a variety of Wild Birds Unlimited’s specially formulated seed, Seed Characters provide a nutritious and fun feeding opportunity for Florida’s wild bird residents and our visiting guests as they pass through the state during their seasonal migratory route. For the more sophisticated wild bird watcher (like Scooter!! ), try the WBU Seed Wreath! These are only a few of the inexpensive products that Wild Birds Unlimited in Clearwater/Safety Harbor offers for this gift giving season! Come into the store today to check out more of our terrific products, perfect for the wild bird lover on your Christmas list this year! Scooter is Talkin’ Turkey for Thanksgiving! Florida’s Own Osceola Turkey! Put down the knives and forks, folks. We’re not giving out recipes on how best to prepare these Florida favorite wild birds for our Thanksgiving tables. We are, however, going to take a look at their history and learn why they are far more than just a seasonal menu item. Named after the great Indian Chief, Osceola by Naturalist W.E.D Scott in 1890, Scott’s observations of this particular bird noted that, unlike the eastern wild turkeys, the Osceola (also called the Florida Wild Turkey) held a more iridescent sheen with less brown or bronze shading. It’s size was also noticeably different. Smaller and slightly darker than its eastern counterparts, Scott surmised that this bird’s stature and coloring were well-suited for Florida’s pine woods, marshes and flat scrub areas where they reside. It’s always a sad thing when a creature so beloved passes away, but when it’s a symbol of strength, grace and endurance, the sting is especially harsh. It is with a sad heart that Wild Birds Unlimited in Clearwater/Safety Harbor announces the passing of Ozzie, the bald eagle featured in the Southwest Florida Eagle Cam live feed. Partner to Harriet, his mate, Ozzie has been in an out of rehab for several months now. Having suffered a broken wing in March of 2015, Ozzie spent time at the Clinic for the Rehabilitation of Wildlife (CROW) on Sanibel where he was treated and released after his recovery. Unfortunately, it is believed that another male eagle moved in with Ozzie’s mate, Harriet (not uncommon in the lengthy absence of a mate), and the two males were seen fighting on September 20th, with Ozzie being further injured while defending his nest. After several days of absence, Ozzie was found, injured, in the backyard of a local Florida residence where he was collected and taken back to CROW for further and continued care. With issues that included septicemia as well as puncture wounds, lacerations and broken talons and toes, Ozzie was not able to survive despite the attentive care and wonderful support of the staff at CROW. Ozzie passed away September 29th while still at the CROW clinic. It is a sad event, showing us that nature, in its seemingly unfair designs, can often carry very brutal ends. However, this is its needed architecture. It assures the strongest endure in a world where strength is the most important factor of survival of any given species. Ozzie’s offspring survive because of his strength. We will miss his aerial acrobatics and his grace, beauty and devotion to his mate Harriet. 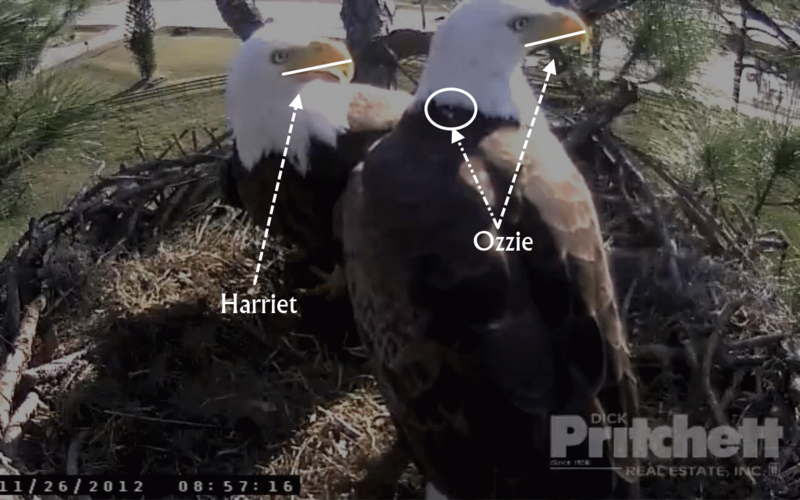 The live feed from the Southwest Florida Eagle Cam will remain running and we hope to see how things develop with Harriet after Ozzie’s absence. 2454 North McMullen Booth Rd. Hammock Bird Banding, Dunedin Fla.